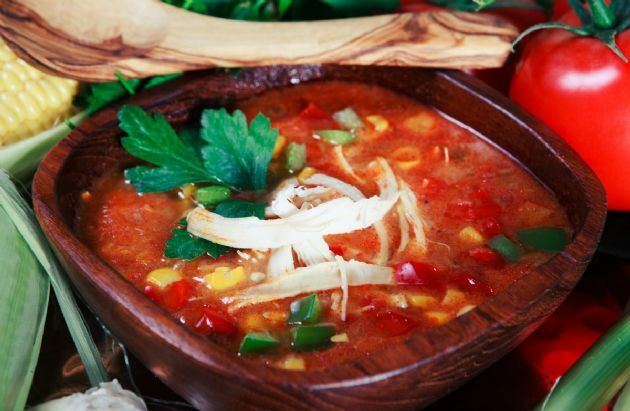 This is an adaptation of my favorite slow cooker chicken tortilla soup recipe. If you have the calories to spare, make some tortilla chips in the oven to eat with the soup and top with a bit of sour cream, cheese, avocado and anything else you like! It is very flavorful on it's own, though. Be sure to use high-quality enchilada sauce, as some brands can be greasy. I like to add other veggies in sometimes, such as carrots and squash. This is an adaptation of my favorite slow cooker chicken tortilla soup recipe. If you have the calories to spare, make some tortilla chips in the oven to eat with the soup and top with a bit of sour cream, cheese, avocado and anything else you like! It is very flavorful on it's own, though. Be sure to use high-quality enchilada sauce, as some brands can be greasy. I like to add other veggies in sometimes, such as carrots and squash. Combine all ingredients in a large slow cooker. Stir to combine. Cook on high 4-6 hours or low 6-8 hours. Remove chicken from soup and shred. Return chicken to soup, stir, and serve. We like things spicy and flavorful, so I also add in a dash or two of cayenne.